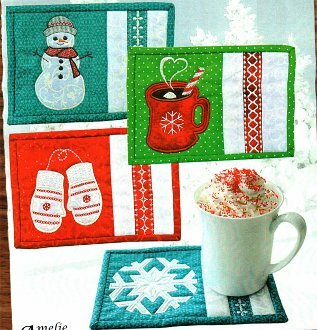 Our Winter Mug Rugs pattern includes snowflake, snowman, hot cocoa, and mittens designs. The pattern includes digital embroidery files for all major machines, step-by-step instructions with photographs, and bonus appliqué designs that you can use on other projects. Supported embroidery formats: ART, DST, EXP, HUS, JEF, PEC, PES, VIP, VP3. This project requires a 8" x 5.5" hoop.